Finally, I'm happy to post these after pictures of Liam's new modern craft/dining table, and I've included the before picture again since its been a few weeks. I will say he eats at it more than he crafts at it, but I couldn't be happier with the FINAL product. I actually went through a process of sanding it down three different times and applying the chalkboard paint after each time to get a nice smooth finish. 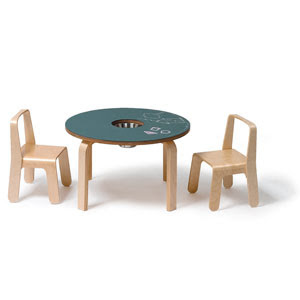 I have found some Ikea childrens chairs that I think will work well with the table, and plan to purchase them soon. See them here. Wow! I think it looks better than the original. Hi Megan! We love the table idea so much be wrote about it over at b is for bloom. Check it out! YOUR version is much better looking than the original. Love this blog! I'm so glad to have discovered it!